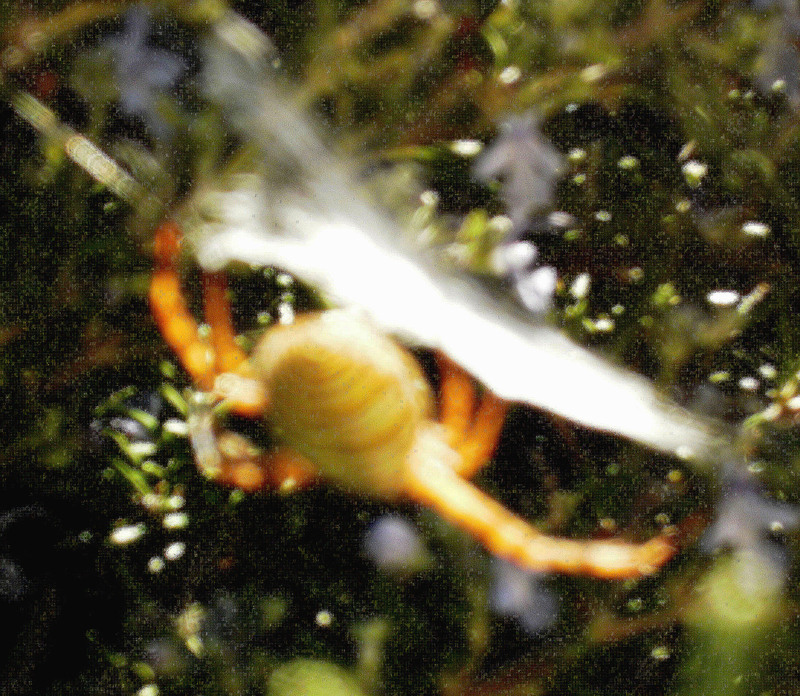 I am sad to report that our pet spider and mother of up to one thousand babies, has died; withered away really (see post when we first met this marble orb weaver). Last weekend I noticed she had three legs on one side missing, possibly eaten by another spider while she was in her weakening state? Or did they drop off? Anyway, I have checked on her several times a day, but today I knew the end was near. She began to lose all her colour and then began to shrivel up. I assume a day is a long time in a spider’s life. 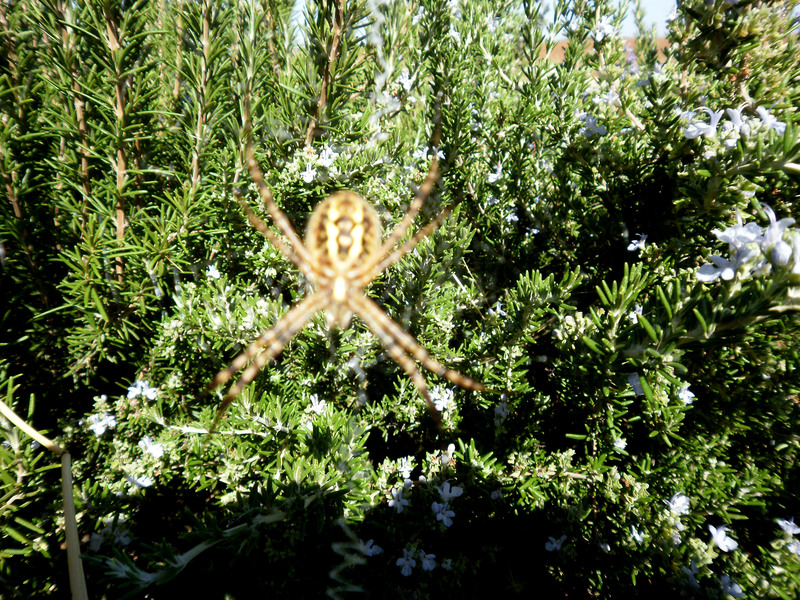 She has made her home in our rosemary bush since January of this year, and ultimately showed no fear of us; at first she would scurry away, but then she got used to us and just hung upside down in the middle of her fantastic web waiting for a honey bee to get trapped in it. 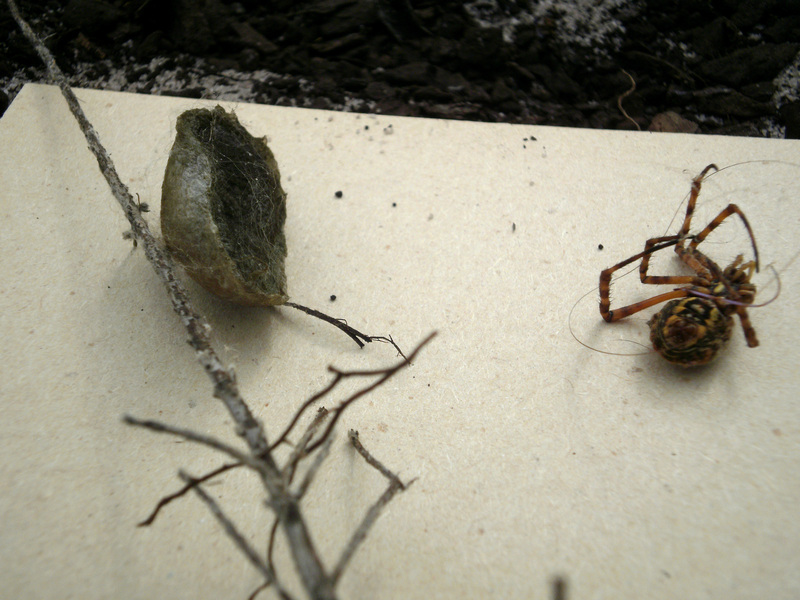 (see earlier post about this amazing spider) Her eggs are still in their cocoon, I am not sure when they will emerge. We have been privileged to watch this amazing spectacle of nature for so many months. I guess she has lived a much longer life than her mate whom she most likely had eaten straight after mating. I used to be terrified of spiders, but not any more. I will be in NZ for ten days so in the meantime, I have posted some photos below of our female pet marble orb weaver spider. I have been taking the photos over a few weeks so you don’t miss out on any of the developments. You will probably remember that the female only lives for one year? 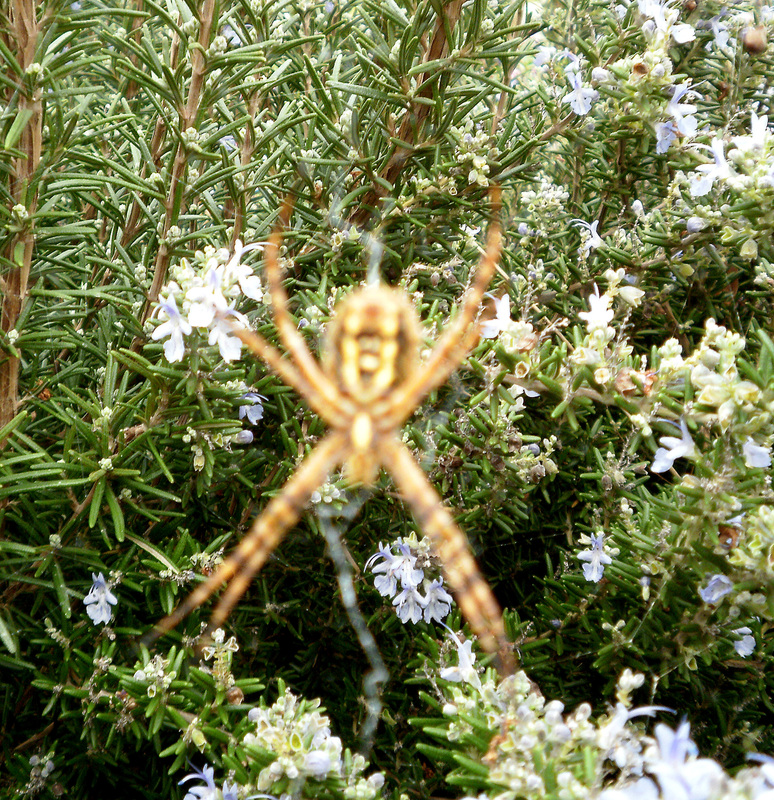 About six months have passed since we have been watching her grow in her spider web in the rosemary bush in our front garden. Her abdomen was quite fat and we thought it was because she was catching all those honey bees that came to the rosemary bush to collect pollen. 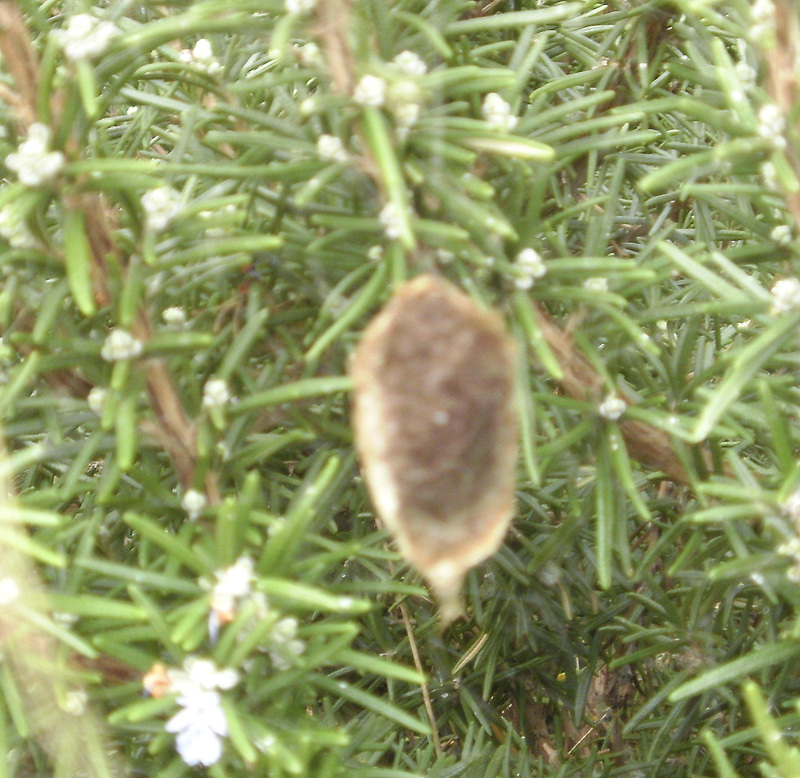 It was partly that, but also because we now know she was carrying many baby spider eggs. This week she laid all those eggs, and she has probably eaten their daddy by now, who was very tiny compared to her! We think nature lets him be eaten so that their babies will be well fed and healthy by the time they are laid. 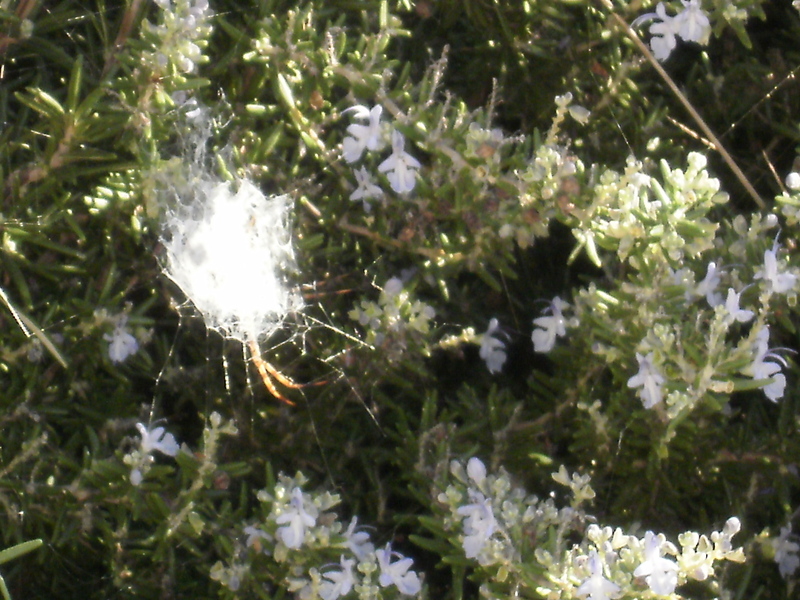 Mummy spider began preparing to lay her eggs by spinning a snow white lacy web in the middle of her big web that she traps the bees in, as shown in the photo. This went on for a week and then one morning, there hanging up behind her big web, was a little leaf packed with what looks like a piece of mud. I suspect the eggs are snug in their little white cocoon under the mud. This weekend Gabe and Jude came to stay. We always have so much fun when they are here! Most of the time, with just Paul and I at home, our house is as neat as a pin. 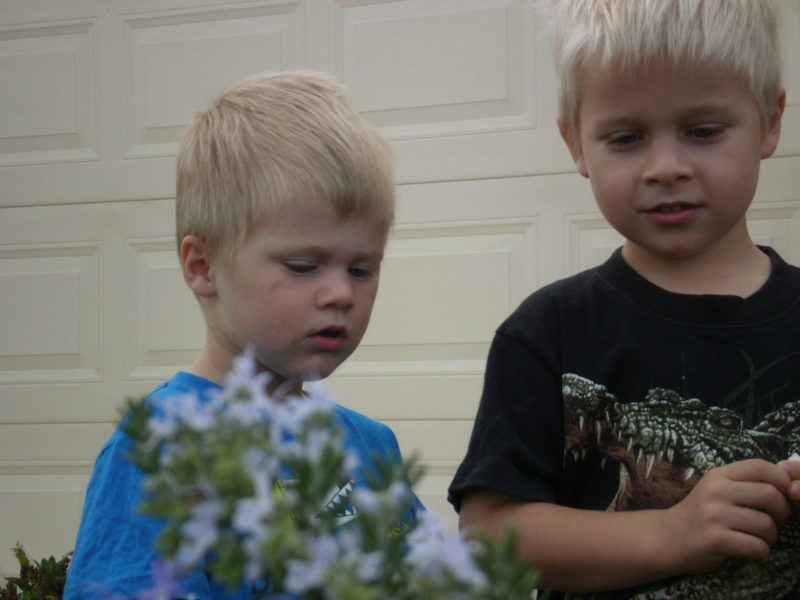 But when the boys come to stay, chaos and mess prevail. And, we would not have it any other way. On Saturday, the boys and I joined Tony & Erin at the Melbourne garden show while Paul spent the day at the Formula One Grand Prix. Sunday was a day solely devoted to the boys; multiple trips to the bike path and playground across the road from our home, and tasty morsels from my kitchen. Cleo the cat hides somewhere in the garden; she is not used to the rough and tumble of little people and I suspect a modicum of jealously lurks in her behaviour!